Looking down accesses the emotional part of your brain. Right now test this out by thinking about something that normally makes you feel emotional, for example an ex-boyfriend or ex-girlfriend. Think the same exact thing looking down and then when you look up. You should be able to feel less emotions as you think this while looking up. This is because the easiest way to control your mind is to control your body. So instead of trying to mentally feel less emotion about something, which gets harder when you do this, simply look your eyes upward and you will feel less emotion. This concept can be applied in various situations, like holding your shoulders down and back will make you mentally feel more confident than when you slouch. But try to focus on your mind to feel more confident and you will find that to be much harder and even make things worse. This is why most athletes are able to deal with stress a lot better than someone whom never played a sport. The opposite is true as well, to have better control over your body, just focus on your mind. Like meditating for example will help your blood flow, breathing, and parts of your brain will even physically change to improve cognition (please click here to read more about meditating). Looking to the right accesses your memory. Looking to the left accesses your creativity. These two directions may shift from person to person, but this is what I’ve found to be commonly true. 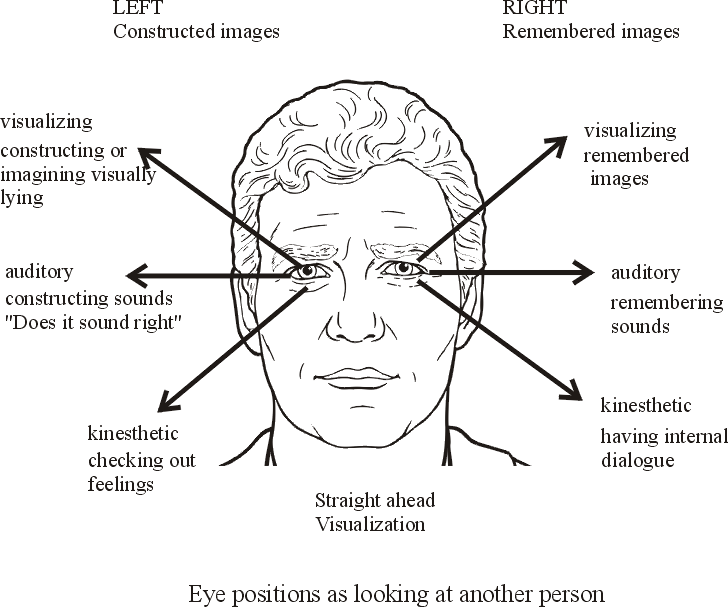 You can “test” this out by asking a person a question, and when you notice the direction they look you can start to tell which way their eye accessing cues are wired. This can help to tell if someone is lying too, but shouldn’t be taken to be 100% accurate, since people can train themselves to lie without moving their eyes for example. If someone has “shifty eyes” moving from left to right a lot, then it’s very likely they are lying.